Thinking of running a marathon? Start taking whey! Athletes who don't dare run a marathon because it would be too much for their system, might change their mind after making a small adjustment to their diet. If they replace a couple of energy drinks or an energy bar with a shake containing whey, they'll speed up their recovery dramatically, according to a small Taiwanese human study published in the International Journal of Medical Sciences. Sports scientists at the National Taipei University of Nursing and Health Sciences in Taiwan did a 5-week experiment with 12 runners. Half of them were given a shake containing 33.5 g whey every day; the other half were given a shake containing the carbohydrate maltodextrin. Both shakes contained the same amount of kilocalories. After three weeks of taking the supplement, the participants ran a marathon. The researchers analysed the blood and body composition of the runners three times: just before they ran, a day after and two weeks later. One week after running the marathon the researchers got the participants to run as far as they could in 12 minutes' time. In this part of the experiment the participants in the whey group covered a greater distance than the participants in the placebo group. After the marathon the researchers found less lactate dehydrogenase and creatine kinase in the blood of the participants in the whey group, an indication of less muscle damage. 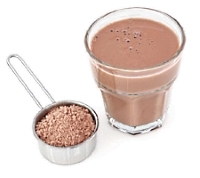 The participants who had drunk the whey shake also had a slight increase in muscle mass. The whey supplement had no effect on the fat mass. "Whey protein is an important nutrient supplement for muscle-building applications with resistance training," the researchers concluded. "In the current study, we found that whey protein can also play roles of physiological protection and performance elevation with various types of aerobic exercise." Int J Med Sci. 2017 Jun 22;14(7):648-54. Japanese researchers have found a simple way for athletes to make their sports drink more effective. For all you endurance athletes who don't know what to ask for from Santa this Christmas, this website has a suggestion: BCAAs, glutamine and arginine. After intensive activity cyclists recover more quickly if they drink a shake containing proteins and maltodextrine than if they drink a sports drink containing only maltodextrine.